Di II: Lenses are designed for exclusive use on digital cameras with smaller-size imagers and inherit all of the benefits of our Di products. These lenses are not designed for conventional cameras and digital cameras with image sensors larger than 24mm x 16mm. The SP AF17-50mm F/2.8 is a lightweight, compact, fast standard zoom lens designed exclusively for digital SLR cameras, expanding the product concept of the popular SP AF28-75mm F/2.8 zoom lens. Exclusive design for digital SLR cameras achieves a fast standard zoom lens that covers virtually the same angles as focal lengths of 26-78mm when converted to a 35mm format. The wide-angle focal length is established at 17mm (26mm equivalent) to obtain a wider angle of view than ordinary standard zoom lenses, while maintaining the remarkably lightweight and compact size of the earlier full frame zoom lens model. Since the lens is designed exclusively for APS-C sized digital cameras, the image circle diameter has been reduced. Moreover, careful adjustments to the design have achieved a lightweight, compact body with a filter diameter of 67mm, overall length of 81.7mm (3.2")**, and weight of 434g (15.3oz.)**. The use of XR (Extra Refractive Index) glass in an innovative way optimises the overall distribution of optical power, and also reduces various aberrations to the absolute minimum while achieving remarkable compactness. In addition, suitable positioning of two hybrid aspherical elements serves to maintain imaging performance and to shorten and compress the entire optical system. Furthermore, an LD (Low Dispersion) glass element is used to accomplish effective compensation of on-axis and lateral chromatic aberrations, a critical factor for enhancing optical quality in digital photography, in order to achieve outstanding optical performance over the entire zoom range. The new lens achieves a minimum focus distance of 27cm (10.6") over the entire zoom range, one of the best in its class among fast standard zoom lenses with an F/2.8 maximum aperture throughout the entire zoom range used exclusively for digital SLR cameras with APS-C sized image sensors. 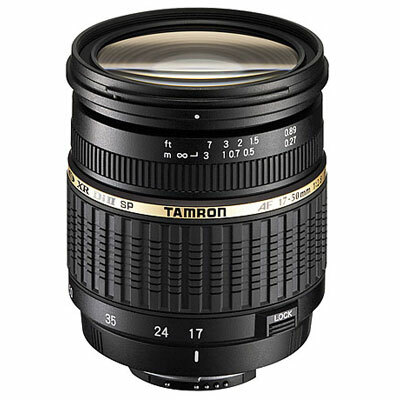 The maximum magnification ratio of 1:4.5*** at the 50mm setting is the top level in its class. Peripheral light fall-off is minimised when compared with that of conventional lenses for film cameras, so images are uniformly bright from the centre to the periphery. Complicated mechanisms are built into the compact body, thanks to new mechanical devices, for excellent portability and ease of use. In addition, a complex triple cam structure where cams zoom and focus within a three-layer lens barrel has been further developed to improve AF focus precision for close-in shots and torque irregularity when zooming in and out. Additionally, the engineering of the lens has been completely overhauled to downsize its parts and to increase their precision and durability, in order to accommodate the complex structure incorporated into the new SP AF17-50mm F/2.8 XR Di-II LD Aspherical (IF). Improvements have been made to the external design by adding a gold-colored band between the focus and zoom rings to enhance the appearance and make the product stand out as a Di-II lens. Also, the black coating over the entire lens barrel creates a high-quality, sophisticated look.